Guitars Repaired in Sedona. Bass, Ukulele and Amplifier Repair. Guitar Strings Installed $3.50 per string. Sedona Guitar Rentals in Sedona. 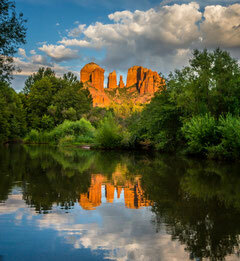 Located in West Sedona, Kenny Ferris is a Versatile Luthier with 40 years experience. He learned to play guitar when he was just 13 years old, and then started repairing guitars when he was 15 years old. Kenny has grown to be very particular about his guitars' set-up and function. Your instrument will be set-up with care to have the lowest Action possible with no fret buzz. Kenny will set-up your guitar to the same high standards that he sets up his own instruments. All repairs are performed by Kenny personally. Kenny repairs Electric and Acoustic Guitars and Basses as well as Ukuleles and various other Fretted Instruments with Steel and/or Nylon Strings. Kenny also was employed in the Amplification Industry in the 70's and 80's and gained much firsthand experience with Tube and Transistor Amps. Kenny offers Amplifier and Speaker Cabinet Repair as well as Cable Repairing and Re-soldering. Dr. Kenny offers House Calls to your home or business to diagnose your instrument and give you a Free Estimate. He can perform minor repairs while you wait. Major repairs will require shop time. Instruments may be picked up by Kenny or dropped off by you at Kenny's West Sedona Home/ Shop. Kenny is also an experienced Music Educator,Offering Guitar Lessons for all ages,beginning and intermediate. Learn to play your favorite music on the guitar using his special techniques for accelerated learning. One on one lessons can include open chords, bar chords, chord progressions, major and minor scales, modes, arpeggios, 12 bar blues, blues scales and improvisation. Students may also learn practicing tips, proper body mechanics, correct finger positions, finger exercises and basic chart reading. Students will be provided with easy to understand work sheets and a protective folder. Lessons are $30 per hour and can be scheduled to meet your needs.